and enjoy watching my students really "get" it! a regrouping packet and I just finished updating the look and fonts this week. One of my most popular posts has been one called The Trading Game. your students play before they learn to regroup. 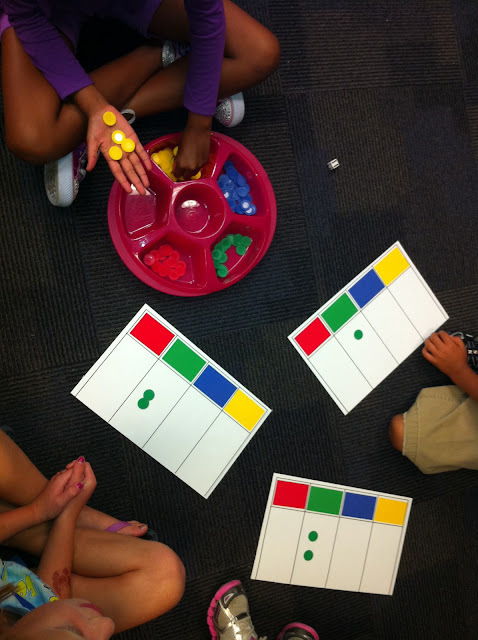 please teach this simple and fun game to your students!!! because they understand the "trading" part of it all. that this will be useful for you! my unit in my TpT shop here! play at the beginning of the year. ago and I've had my students play it ever since. I LOVE it because it is sooooo meaningful. goes by out in bloggy world. on the way you decide to have your kiddos play. You really play it up. 3 meals a day, have 3 kids, 3 pets, 3 cars, 3 houses, etc.."
Gameboards- When I moved to second a few years ago, I found a handful of these in a closet. When I attended the workshop, I realized what they were. I had to make the rest which was not difficult at all. Just construction paper, ruler, glue, sharpie, and then laminated. Colored poker chips- I bought a bag of 1000 from Teacher Direct a few years ago. match the boards you use. Chip holders- I really like using these chip/dip trays I found in Target's dollar spot to keep the chips organized. I like to put 4 kids in a group so 1 will be the "banker" (in charge of the chips) and the other 3 will be playing and each need a gameboard. The "banker" (I choose the banker for each group) is the only person allowed to touch the chip tray and take chips in and out. 1 player rolls the dice. They ask the banker for that many YELLOW chips. Since the game is "3 Town", every time a player gets 3 YELLOW chips they can trade in for the next color, so on my gameboards that is BLUE. If they can trade in their chips, they need to do it before the end of their turn, or before they pass the dice to the next player. Example: Player rolls a '5'. Player says to the banker, "Can I please have 5 YELLOW chips?" The "banker" then gives them 5 YELLOW and the player puts them on their gameboard in the YELLOW column. The player will then take 3 of the newly acquired chips and ask the banker, "Can I please trade these 3 YELLOW in for 1 BLUE?" The "banker" takes the chips and gives the player 1 BLUE, who then places it on their gameboard. 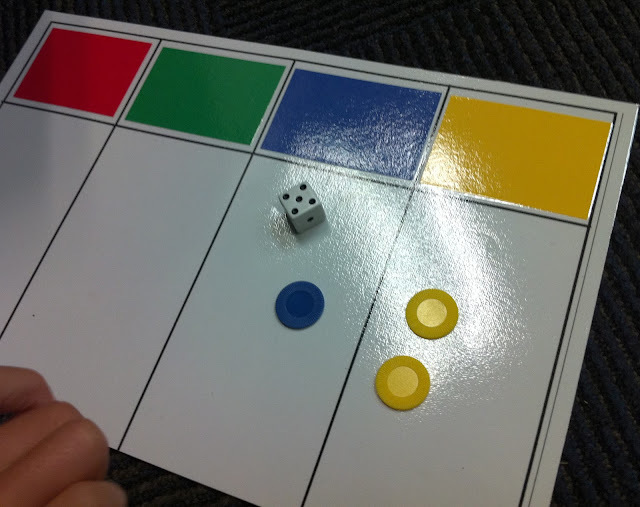 If the player decides they can not trade in anything else, they pass the dice on to the next player. When a player gets 3 BLUE, they can trade in for 1 GREEN. If they get 3 GREEN, they can trade in for 1 RED. The first player to get 1 RED chip is the winner! But, seriously, the kids get addicted to this game. Model, model, model. The first day I introduce the game, students are watching me play and I usually have 1 or 2 other kids "play" with me as we go through an entire game for everyone to watch. I am picky about the "banker" handing the chips to the player. Sometimes, they want to just put it on the player's board for them. We talk about how each player needs to be in charge of their board and its their job to PAY ATTENTION and realize when they can make a trade! Some kiddos like to run everyone's board so we talk about this a lot. During a player's turn, they can make as many trades as they need too, but they only roll 1 time each turn. If they pass the dice and the next player starts to roll, they can't make a trade until their next turn. If a group finishes, they can start over and the winner will become then new "banker". it's great to be able to use phrases like "Now we're going to trade in 10 ones for 1 ten"
because they've been playing the trading game! Join in on the Throwback Thursday fun! Link up with Cara here! I'm so glad that you reposted this! 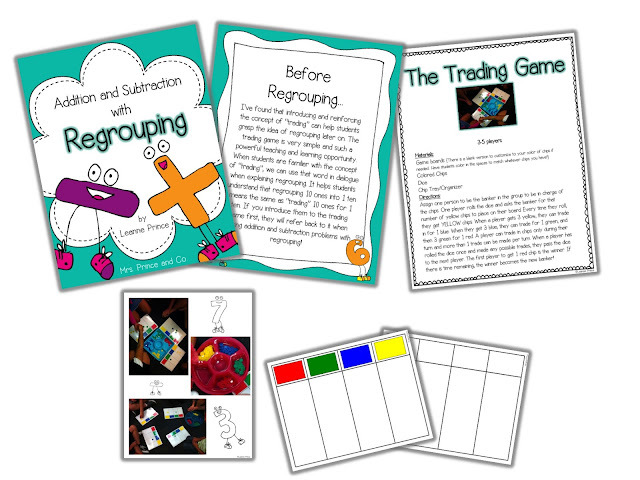 My students have always had a hard time with regrouping and I've been racking my brain to figure out some type of visual or game for them to practice regrouping. Thank you for sharing! Hi! 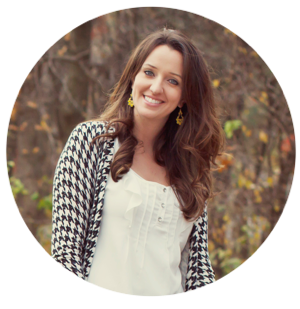 I found your blog through the Throwback Thursday Linky and I am your newest follower! This game is great!! 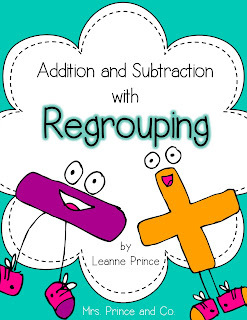 I taught 2nd grade for 11 years and this is a perfect way to introduce regrouping. Games are such a wonderful way to introduce a concept! I will definitely share this post with my 2nd grade friends...and try it out at the end of this next school year in my classroom ( I will be teaching 1st this year). Can't wait! I know they will love it! Thank you so much for sharing! Similar to the rest of the posts, I also thank you for re-posting this! Thank you so much for re-posting this! I am definitely pinning this to use! 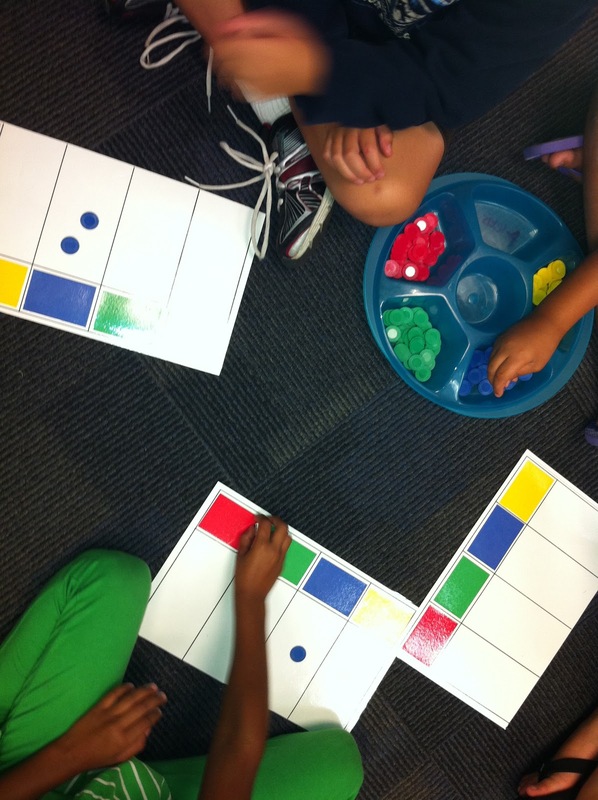 Thank you so much :) It is a great idea to help with regrouping.